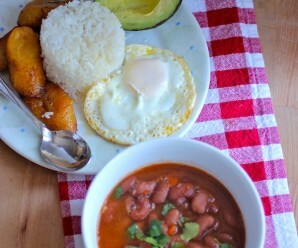 Three favorite ingredients of Colombian Cuisine are featured in this delicious soup; beans, sweet plantain and avocado. This is a complete vegetarian one-pot meal and all that it requires as an accompaniment is white rice. Enjoy! Wash the beans and discard any debris. Place the washed beans in large pot and cover with 10 cups water. Let it sit overnight or for at least 5 hours. In a medium sauce pan, heat the olive oil over medium-high heat. Then add the onion, garlic, scallion, red bell pepper and green pepper. Cook for 5 to 7 minutes or until onions are translucent. Bring the beans to a boil then add the vegetable mixture, ground cumin, oregano and bouillon tablet. Cover and reduce the heat to low and cook for 1 hour. Add cilantro, tomato puree, salt and black pepper. Cover and cook for another 60 minutes or until the beans are tender. To make the cream: In a food processor, combine all the ingredients and process until smooth consistency. Place the diced plantains on a large skillet with 1 tablespoon vegetable oil and cook until golden. Ladle the beans in a bowl and top with plantains and avocado cream. I love black bean soup! Sweet plantains and avocados too…Delicious! I can’t begin to tell you how good this looks to me right now! I adore black beans; I’ve never had plantain, but it looks so good, especially with the avocado. Looks absolutley delicious! Love the avacado cream! The colors in the soup are gorgeous! I’ve never had a plantain before, but they sounds great. I love black bean soup! I still have not tried a plantain! Isn’t that just crazy!! I would love to try your soup, it looks so fabulous! O wow! This looks so wonderful and different to other bean soups I make. Thankyou so much! vat a n awesome soup!! sound delish, healthy and yet simple!! good work erica!! cheers! The avocado cumin cream sounds really innovative Erica. What an delightful combination of black beans & plantains and the avocado cream is perfect with the soup! Thank you all for the comments and for visiting my blog! what a delicious been soup!! I love beens & the colours contrast in this soup is great! You don’t taste the sour cream!! !Try it! I make blackbean soup a lot but never thought about the plantain – Erica you are brilliant! I am making this!!! Looks delicious, healthy and satisfying. The kids will love it!! I’m looking for a Columbian recipe for a book club evening. This sounds perfect as we try to make dishes that are prepared in advance so as not to distract from the book discussion. I know the soup can be made in advance but what do you suggest for the plantains and avocado cream? Yup, this soup sounds absolutely perfect. I want to try it sometime soon. Dear, Erika. 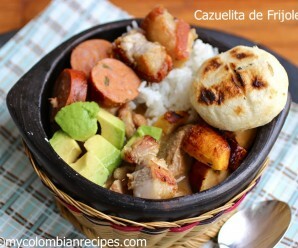 I am from Tulua-Valle, Colombia and I made this recipe for this past Thanksgiving dinner. It was a hit; the avocado cream is another level in avocado recipes. For me, it tastes better than the traditional homemade guacamole. The beans are “una delicia.” I chopped the plantains which was harder to cook, but I managed them perfectly. I have tried once before the Black Beans in a Cuban recipe, and I believe they are overlooked among other beans when they can taste so good if know how to cook them. Finally, I recommended to my American-Colombian family members your blog and told them about the different and gorgeous plates one can find here. Keep the good work!! And thank you for sharing your ideas paisana!! I usually write to your taste. The ingredients list calls for 12 cups of water; the directions say 10 cups. Which is right? Or did I miss something?